I too was quite surprised when I heard the name Bruce Lee and was asked by a SKM Canadian subscriber, Jeff Hutchings, if I’d like an interview/story on Bruce Lee! Then I found out that this particular Bruce Lee was in fact a senior Shotokan sensei based in Newfoundland, Canada. Obviously this caught my attention and in this edition we have this excellent little tale about a very traditional karateka, a former student of the late Nishiyama sensei. One of the most requested authors and contributors to SKM over the years has been Dr Dave Hooper. Dave has been a friend of mine since he walked into my dojo in 1986. He was looking for a dojo in the Manchester area where his friend could train. After a conversation with him where he told me that he trained at the JKA Hombu dojo in Japan and at Takushoku university, of course I immediately invited him to teach the class. WOW! It was an absolute eye opener, we had never seen a ‘western’ Shotokan karateka with a technique like Dave Hooper’s. It was pure JKA Shotokan and he had captured the feeling of it perfectly. His technique was so clean, very relaxed and seemed effortless compared to ours at that time in the 80’s. We were used to training with top British instructors, and although excellent in their own right, in truth, they did not have this type of technique. Theirs I feel was a completely different (although equally effective) technical emphasis. Dave Hooper had a huge effect on the dojo’s that he visited and taught at in this country, especially regarding hip-action and stances. At the time he was based in Anglesey at Bangor university until he returned to Japan. His first article for SKM, entitled ‘The Way versus The Cul de Sac’, caused quite a stir as many people will remember! And thankfully Dave has continued to contribute articles over all these years. The one in this edition will not disappoint, I’m certain of that. For many people who started karate in the 1960’s/70’s, after one arrived at 3rd kyu (Brown-belt) level, many times you were asked to ‘teach’ the beginners class or maybe a children’s class. So really you were thrown in at the deep end! As Dave Hooper’s article suggests, a teacher’s role should be to devise a programme of learning through which the student can effectively make progress. I really like Nelson Vaughn’s articles in this edition and in the previous issue. The discipline and guidance in a good Shotokan dojo can have a huge, positive effect on children and hopefully head them in the right direction in life. Teaching children’s classes is not easy but maximum respect to those who have the patience and belief to do this. I’ve recently been training with sensei Gustavo Reque in Marbella, Spain. 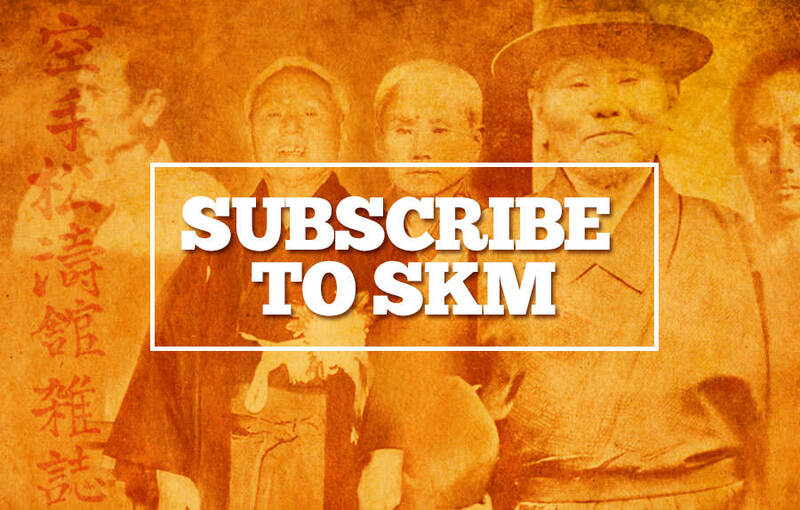 You may remember that we had an excellent interview with Gustavo Reque in SKM issue 82. He’s also a practicing Osteopath with over 40 years experience. His emphasis on Shotokan for health; respecting/protecting the body by refing technique, especially for older karateka, was enlightening. THOUGHTS FROM JAPAN...TEACHING: LET’S HAVE LESS OF IT. By Dr Dave Hooper. Author: Dr Dave Hooper 4th Dan JKA. I recently returned to Japan from an academic conference in Cambodia on English language teaching. English is my mother tongue. Having used it in a myriad of ways nearly every day since the age of about two, I believe that I have become rather good at it. This is not an accomplishment that warrants excessive adulation, however, as I seem to share a level of expertise with almost the entire population of the English-speaking world (even if we generously include Americans). The adjectives erudite and articulate might not readily spring to mind when encountering large swaths of the British population, but barring physical or mental defects (and despite what passes for a general education these days), most native speakers are relatively fluent and lucid. Verbal communication is spontaneous and natural, requiring apparently little conscious effort. So what, you may be wondering, with my level of English, could I possibly have to gain from a conference in Phnom Penh of all places? I mean, let’s face it, English can’t be that difficult to teach. (You might also be wondering what relevance this might have to karate. Just bear with me.) I acquired my language skills entirely effortlessly, largely through a process akin to osmosis, while getting on with all the other much more important things that occupy a toddler’s mind. (The cynical amongst you are probably putting my attendance at this conference down to the fact that at the time of writing, Tokyo was in the midst of winter, and with the academic year about to come to an end in this part of the world, I had been desperately searching for a conference in sunny climes where I could legitimately use up the outstanding portion of my research fund. Well, OK, there might be some truth in that...) Probably, of course, you are not equating my presence at an English language teaching conference with my status as a native speaker. Nobody assumes that just because you are proficient in a language you are ipso facto qualified to teach it. Actually, I ought to qualify that last statement: 35 or so years ago, when I first arrived in Japan as a fresh-faced teenager from London, hoping to find a job—any job—to support my planned year-long stay to practise karate, teaching English was the only thing the Japanese authorities deemed me capable of doing. A genuine native speaker claiming to speak the Queen’s own English, was something of a rarity back then. Being white and male was also something of an advantage. Language schools were anxious that their “teachers” looked the part, even if they might not have the faintest notion about the honourable profession to which they were claiming to belong. In fact, the only negative mark against me was my age. The first few schools to which I offered my services were all enthusiastic about employing me until I mentioned I had just turned 19. To the Japanese, of course, a 19-year-old looks about 15, behaves as if he were 12, and would be utterly incapable of looking after himself in a foreign country where he spoke none of the language, knew none of the people, and couldn’t eat any of the food. Offering employment to someone of such tender age would be foolhardy to say the least. But I was British! Dave Hooper teaching at Kanda Sensei’s dojo in Saitama Pefecture, Japan. In the karate world it is often assumed that once you have reached a certain level you are, by definition, a teacher. Regardless of any natural aptitude, let alone qualification, an individual might possess in that regard, the belief exists that if you can do it, you can teach others to do it too. And if you can boost your credibility with a string of awards and competition medals, then so much the better. By the time your shiny new silk belt begins to show signs of wear (if you purchased the correct one, that is usually within about three weeks of light to moderate training), you are almost duty bound to open your own dojo. In fact, if my understanding of the way Taekwondo operates in the UK is correct (I am, for the sake of argument, giving it the the benefit of the doubt, and including it as a form of karate), this is taken as a given. It relies on the “senior” grades to instruct and help expand the empire. Like a gigantic “Ponzi” scheme, a huge turnover of impressionable kids allows those at the top to maintain their position, by expecting each new black belt to perform their teaching duties, and help cope with the next big influx of recruits who have been seduced by a sophisticated and enticing advertising campaign. In terms of martial arts, value for money it clearly isn’t. But hey, it’s still cheaper than using a bonafide baby-sitting service! Shotokan karate clubs in the UK obviously still have much to learn. The days in which every English-speaking foreigner in Japan was assumed to be a budding English teacher are now a thing of the past. Universities now demand post-graduate degrees, and even the fly-by-night language schools expect some kind of paper qualification. Not that the level of English in Japan has noticeably improved. The Japanese population by and large still heads the list of least-able-to-communicate-intelligibly-in-English, in South-East Asia. For those who are interested, there are reasons peculiar to Japan that might help explain this lack of progress, not least of which include an education system that regards actual communication as very much a secondary function of the language, and a widely held view that an ability to speak English is completely unnecessary in Japanese society, if not a positive disadvantage. However, I digress. There are, I believe, some interesting comparisons to draw from the teaching of English as a foreign language, and the teaching of karate. I have been involved with both activities for most of my life, and the principles that apply to one sphere of teaching and learning invariably, in my experience, apply to the other. Years ago, one of my university professors offered the opinion that there were basically three types of teacher in the world: the entertainers, the lion-tamers, and the new romantics. He wasn’t suggesting that these were necessarily mutually exclusive. Rather, teachers frequently displayed attributes that were they to be assigned to one of those groups Hogwarts-style, the “sorting hat” would have little trouble deciding to which group they belonged. While the entertainers can keep their students’ attention and make the learning experience enjoyable, there are those that would argue that it is the lion-tamers who get results. Discipline is what is required; without it, the most entertaining and engaging teacher is a non-starter, and the new romantics, despite their altruistic motives and earnest desire to ‘make a difference’, will not get a look in. As a reasonably well-behaved 12-year-old in a traditional London Grammar School in the 70s, I well remember one of the fiercest lion-tamers I ever encountered: Mr. Davies, the geography teacher. We were required to sit with our backs straight and our arms folded for the duration of the class, and only put up our right hands when asking a question. Written work had to be presented in ‘beautiful penmanship’, and any boy found fiddling with his fountain pen, when his arms should have been crossed and immobile, had the offending (usually expensive) implement thrown out of the nearest window, to be retrieved after the class. Woe betide any boy who had litter in the vicinity of his desk, or who was improperly dressed (whose tie, for example, had loosened to the extent that the top shirt button was visible, or whose hair appeared slightly disheveled or unkempt). I recall the first occasion on which Mr. Davies’s unique brand of discipline was demonstrated. It was during only the second class of the year. Mr. Davies walked into the classroom, slightly earlier than expected. Prior to his entry the noise level had not been excessive, but the second he arrived, the silence became deafening. “Who was shouting?”, he asked, as he took his seat in front of the class. We all looked blankly, knowing that nobody had actually been ‘shouting’ (even accounting for the excessively acute hearing that Mr. Davies obviously possessed). We desperately hoped that the question was merely rhetorical. When nobody responded, Mr. Davies ordered the form captain to point out the culprit. In a spirit of self-preservation, he selected David Evans, probably the quietest and least unruly of us all. Mr. Davies ordered the hapless individual to the front of the class, and then administered his infamous ‘face-warmer’. Smarting from the resounding clout around the side of his face, David, the sacrificial lamb, returned to his seat, his face noticeably ‘warmed’ by the encounter. We were all aware of the injustice that had been done, none more so, presumably, than the form captain. However, none of us seemed to suffer any long term effects from such experiences (except perhaps the form captain, who went on to become a Member of Parliament, and is currently Minister without Portfolio and Senior Parliamentary Adviser in Her Majesty’s Government in the United Kingdom). As unsound as Mr. Davies’s teaching strategies might appear in today’s world, I should say in his defence that no pupil in his geography set ever failed their “O” or “A”-level examinations—nobody dared. There has always been a debate over whether good teachers are born or made. Experience leads me to the conclusion that while training can improve and enhance immeasurably a teacher’s ability to perform, there will always be those who have a natural aptitude and flair that no amount of training can provide. They instinctively respond and adapt to any given learning situation with a degree of spontaneity that no amount of preparation can give them. The karate world, both in and out of Japan, clearly has its share of lion-tamers, entertainers and new romantics. However, to return to that original assertion, teaching itself is arguably the least important role of a teacher. If the primary role of the teacher is being observed, then perhaps it doesn’t matter which category the teacher falls into, or what he or she might do in front of the class (within reason, of course). And that main role, according to Professor Paul Nation, the keynote speaker at my conference, is this: to create and organise a programme of learning through which the student can effectively make progress. Albert Einstein famously said, “I never teach my pupils. I only attempt to provide the conditions in which they can learn”. Einstein obviously knew a thing or two about English teaching, as well as karate! Years ago, when I first had the “pleasure” of training at the infamous Takushoku University karate club in Tokyo, one thing that rather surprised me was that Tsuyama Sensei, the main coach of the club, was so frequently absent. The club, however, enjoyed the reputation of being probably the strongest and most successful in the entire country. There are few particular classes that Tsuyama Sensei taught that stick in my mind; what I do remember, however, is the programme of training that he set up, and from which the class never deviated, whether he was present or not. There was no wasted time, and the structure and content of the syllabus ensured that progress was made. By the end of the first year, the worst of the students was better than most of the fourth-year students at many other universities. By the time they reached the fourth year at Takushoku, there was a formidable group from which to select an almost unbeatable team. The list of world-famous karate-ka who graduated from that training programme and went on to become full-time JKA instructors is impressively long. Traditionally, in Japan, the study of the martial arts has been one of self-discovery. This philosophy of learning permeates much of Japanese teaching, and can often conflict sharply with a typical western approach. For the Westerner impatient to make progress, the teacher is there to provide the answer. What is expected is a rational and logical explanation to justify the adopted training methodology. Sometimes, in Japan, the lack of immediate and direct intervention can be frustrating. In my first three months of training at Takushoku, I remember the difficulty I had with gohon kumite (the basic 5-step sparring practise that most Westerners rarely engage in much beyond yellow belt). The difficulty wasn’t so much intellectual—I could easily comprehend the purpose and theory of the exercise. What I couldn’t do was avoid being hit on almost every occasion, and for a gruelling thirty or forty minutes of each class. We would line up facing each other, the first and second-year students on one side (the white belts), and the third- and fourth-years on the other (the black belts). Despite the colour of my belt, I was, as a “visitor”, always relegated to the most junior end of the white belts. This meant that my first opponent would be the most junior, and thus the weakest and most pathetic of the black belts. I remember the first occasion on which I faced this weak and pathetic third-year student. He launched his first attack like a ballistic missile—strong, fast, accurate and powerful. I managed to block it, but was already stepping back in anticipation for the second attack when I realised he was still stationary, waiting there, balanced and poised, to deliver the second punch when and only when—he was ready. I had just got back in position when he flew at me with the second attack, surprising me as much as his first had done. He delivered all five attacks with equal ferocity, and then it was my turn. The whole exercise was done in triplicate, so by the time we had performed the five jodan attacks to the face three consecutive times, I was exhausted. Then it was time for chudan. If I had thought that his stepping punches to the face were pretty serious and dangerously close to the target, that was only because I hadn’t yet seen the chudan attacks. The first one hit me smack in the solar plexus, and then, funnily enough, so did the next fourteen. By the time we had finished the practice, I had gone beyond exhausted, and was concentrating hard on the increasingly arduous task of breathing. There were only a few seconds respite before Aihara Sempai, the club captain, yelled out “koutai”, and we changed partners. From that point, things got worse. With each successive change, my opponents became faster, stronger and more powerful, as I proceeded further and further up the line. If I stepped back quickly enough in time to block the punch, my block was invariably too weak to be effective. If I stepped back and blocked with enough strength and power to deflect the attack, it was invariably too slow. Did Tsuyama Sensei ever offer a word of advice? He did not. He clearly recognised the inadequacy of verbal instruction, and left me to discover the solution for myself. Without insisting we do the practise repeatedly, however, (and performed, I should stress, within his strictly laid out parameters) the opportunity for that essential and fundamental learning would not have arisen. The Japanese model of example and imitation works well provided those whom you are observing are sufficiently skilled. The system becomes self-perpetuating. Expectations are high, and the novice student, who is initially as awkward and uncoordinated as his western counterpart, slots into a learning environment within which he is culturally at home. Japan’s ability to consistently produce karate-ka of an exceptionally high standard is not due to any evolutionary quirk of nature. It happens because there are a sufficient number of dojos where the conditions in which learning can occur have been created. The sempai/kohai system is an integral part of this learning environment: it is often not the teacher who intervenes directly to “teach”; rather it is the sempai who are setting the example, providing the model and “facilitating” the learning process. What the sensei is doing is simply setting up and structuring the programme, within which everything else takes place. Much of the format and style of traditional karate teaching in the West has been copied from Japan. Japanese karate teachers, who first ventured out of their home environment back in the 60s and early 70s, attempted to transpose a teaching methodology from a familiar cultural setting into one which was entirely alien. The success they had was, understandably, varied. It must have been frustrating and confusing for them when Western students behaved in a, well, very unJapanese way: they turn up for training only two or three times a week because anything beyond that level of commitment is verging on the fanatical; they miss a class just because the wife/girlfriend has threatened to leave as obviously karate is more important than her anniversary dinner; they ask irrelevant questions about Eastern mysticism, and how exactly Zen Buddhism relates to the correct state of mind for performing a stepping punch; or they request to learn another advanced kata or do some proper free-sparring because, quite frankly, we’ve been doing basics for weeks and isn’t it time we moved on? After recently teaching a class in Cambodia, Dave Hooper (centre kneeling). These days the world has become smaller. Japan is not as exotic as it once was, and Westerners here are no longer the oddity they once were. That’s not to say, of course, that Japan doesn’t still attract more than its fair share of odd foreigners. There are skilled and knowledgable Western karate-ka, some of whom have trained extensively in Japan, spreading the message across the globe. If I might be permitted to offer a little bit of advice to those with responsibility for students of their own, it is this: do a bit less actual teaching, and devise a programme of training that allows enough time for actual practice. Practice is not merely repetition. Practice demands creativity and invention. It is about making progress and moving on by engaging. People need to discover things for themselves. That is not going to happen if half the class is spent listening to the sensei prattling on about the theory of technique, the best way to score a point in competition, or (God forbid) how best to disarm the would-be mugger that you are likely to meet on your way home from the dojo. It’s not the theory of karate that people have difficulty with; it’s the execution. White belts and black belts can practise the same techniques, in the same period of time, but at very different levels. Unless you do enough of any technique to get consistency, and a feeling for the movement, the process of self-discovery cannot even start. It is like those poor little Japanese blighters in the English cram school who are forced to sit and read for over half the class: the teacher knows the answer to the problem that if they don’t do the reading there and then, when are they going to do it?—They never will. The British novelist, W. Somerset Maugham, in The Razor’s Edge writes: “You learn more quickly under the guidance of experienced teachers. You waste a lot of time going down blind alleys if you have no one to lead you.” Whilst there is undoubtedly some truth in this, traditional JKA karate is not something that needs to be, or indeed can be, learnt quickly. 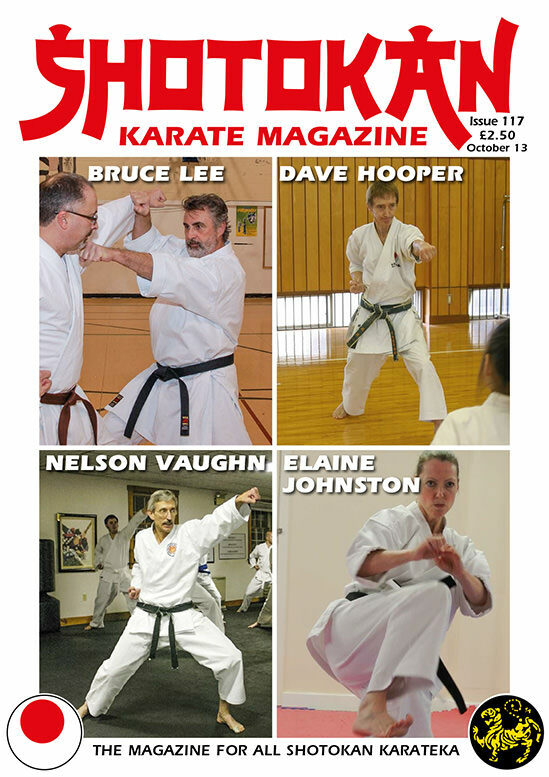 Unlike sports karate, the study of JKA karate-do is a life-long pursuit. Nobody can give you the answers. The secrets of karate are revealed only through consistent and regular training. And sometimes, it is in those blind alleys, on our own, when we unexpectedly catch a glimmer of light and make a bit more progress.